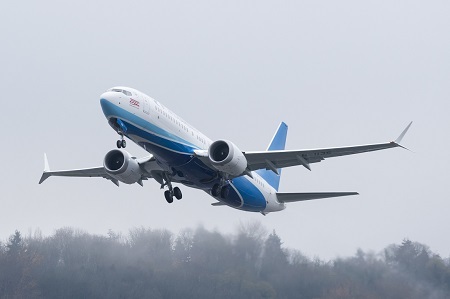 Boeing delivered its 2,000th aircraft to a Chinese operator, a 737 MAX for Xiamen Airlines during last week. The milestone and the pace at which it was reached reflect the accelerating growth in the world's largest commercial aviation market. "We are deeply honoured to have achieved this delivery milestone in close partnership with our great partners in China. Our long-standing industrial relationship in this market has been mutually beneficial, fueling significant growth in Boeing's business, the U.S. economy, and the Chinese aviation industry," said Ihssane Mounir, senior vice president of Commercial Sales & Marketing of The Boeing Company. "We are grateful for the trust and confidence of great customers like Xiamen Airlines. Our teams are focused on supporting them by designing and delivering the best aeroplanes and services in the industry." The new 737 MAX delivered today sports a special logo commemorating the milestone. It is the eighth MAX aeroplane to join fast-growing Xiamen Airlines, which operates the largest all-Boeing fleet in China with more than 200 jets. The carrier also uses Boeing Global Services to improve the efficiency of its network and operations. Xiamen is the first Chinese airline to use Optimised Maintenance Program, which leverages Boeing AnalytX to recommend customised aeroplane maintenance plans. China's commercial fleet is expected to more than double over the next 20 years. Boeing forecasts that China will need 7,690 new aeroplanes, valued at $1.2 trillion, by 2038. Boeing also forecasts China will experience strong growth in the commercial services market with demand growing $1.5 trillion over the next 20 years, accounting for 17% of world demand. China also plays a major role in building the world's jetliners. The Chinese aerospace manufacturing industry supplies parts for every Boeing jet, including the 737 MAX, 777, and 787 Dreamliner. In December, Boeing and the Commercial Aircraft Corp. of China (COMAC) are set to deliver the first 737 MAX aeroplane completion and delivery centre Zhoushan, China. The facility will handle interior work and exterior painting of 737 MAXs for the Chinese market. Final assembly work will continue to be done at Boeing's factory in Renton, Wash.
Boeing activity in China is valued at more than $1 billion in economy activity in China. This includes procurement from Boeing's extensive supply base, joint venture revenues, operations, training, and research and development investment. .